One indication of the growth of self-employment activity has been the rise in the number of people filing Schedule C income and self-employment earnings in their annual tax filings. This growth has been cited to illustrate the escalation of self-employment and to suggest that Bureau of Labor Statistics (BLS) measures of self-employment are missing an important phenomenon. Tracking headcounts of tax filings, however, does not adequately reflect trends in the economic impact of self-employment since, as this analysis shows, most of the growth is activity for supplementary incomes. The economic scale of these activities has not changed much when measured as a share of economy-wide total hours worked, earnings, or compensation. While headcount measures of self-employment activity do show a large increase, the overall economic impact of this activity is relatively small in scale and growth. The following table summarizes SSA data through 2015, the most recent year available, by “type of earnings”, meaning it distinguishes between those with regular W-2 earnings and those with self-employment earnings: the data show the number of individuals with each type of income and the amount of earnings from each type of earnings. Note that in any given year or at any particular point in time, workers can have income both from regular W-2 employment and from self-employment. One indication of this is that the sum of W-2 filers and the self-employed exceeds the total number of workers, indicating that about 40 percent of self-employed also filed a W-2. This analysis of self-employment filings also captures the corresponding trend in Schedule C filings since two-thirds of Schedule C filers also report self-employment earnings and those who do not “report a loss (or have net income less than the $400 Schedule SE filing threshold) [and] therefore are not required to pay self-employment tax using Schedule SE.” (Jackson et al 2017, page 11). That is, the Schedule C filers not captured by examining Schedule SE filers are primarily those with extremely small self-employment incomes or have losses and their inclusion would only strengthen the conclusions of this analysis that the growth of self-employment primarily reflects increased supplementary income activity. As is the case with Uber, gig work overall, or overall self-employment from other data sources, the SSA data show a sharp rise in individuals participating in self-employment activities—a “headcount” measure— but a small overall “economic impact” measured as self-employment earnings’ share of total earnings. For instance, Table 1 shows the number of filers of self-employment earnings grew far faster than those for regular W-2 earnings from 2000 to 2015, 33.0 versus 8.6 percent. The surge of self-employment activity, interestingly, does not coincide with the growth of Uber and other gig platforms: between 2012 and 2015 the growth of self-employment filers grew by 5.6 percent, not that much greater than the 4.3 percent growth of W-2 filers. As Table 1 and Figure A show, self-employed filers were 11.7 percent of all filers in 2015, up from 9.6 percent in 2000. So, the share of earners who have self-employment income rose 2.1 percentage points between 2000 and 2015, clearly demonstrating the expansion of self-employment activity and a greater headcount. It is noteworthy that there was only a very modest expansion of self-employment over the 2012–2015 period (rising from 11.5 to 11.7 percent) at a time when online platform work was rapidly growing. Have self-employment earnings become more important in terms of their overall economic impact? Table 2 shows that inflation adjusted self-employment earnings per filer actually declined 5.8 percent from 2000 to 2015 while W-2 wage earners saw their annual earnings grow by 8.5 percent. 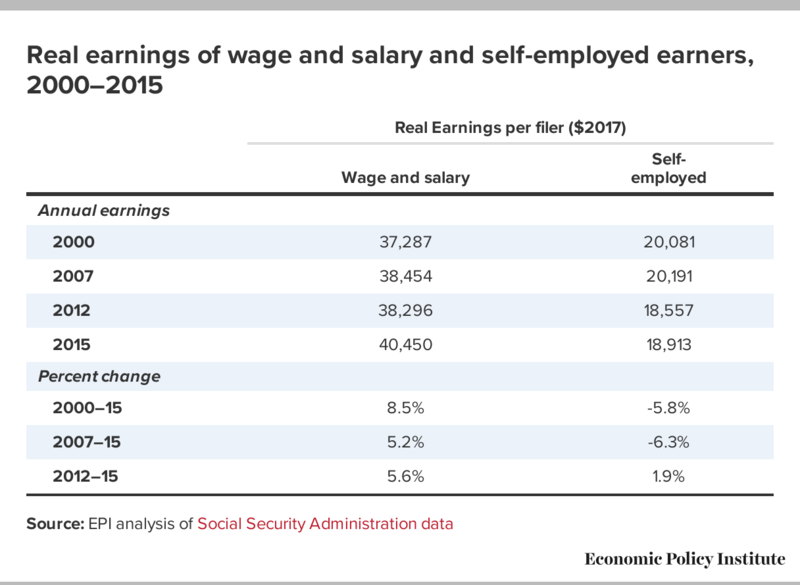 Annual earnings of the self-employed in 2015 were less than half that of regular W-2 workers. This growing disparity in earnings is consistent with those newly self-employed doing so on a part-time basis earning supplementary income. This is consistent with what the Treasury Department study (Jackson et al 2017, Table 6) of self-employment using tax data showed: the categories of self-employment that expanded had below average self-employed earnings in 2014, $1,600 among those who are primarily W-2 workers and $12–14,000 among those who have small enterprises with less than $5,000 in expenses. 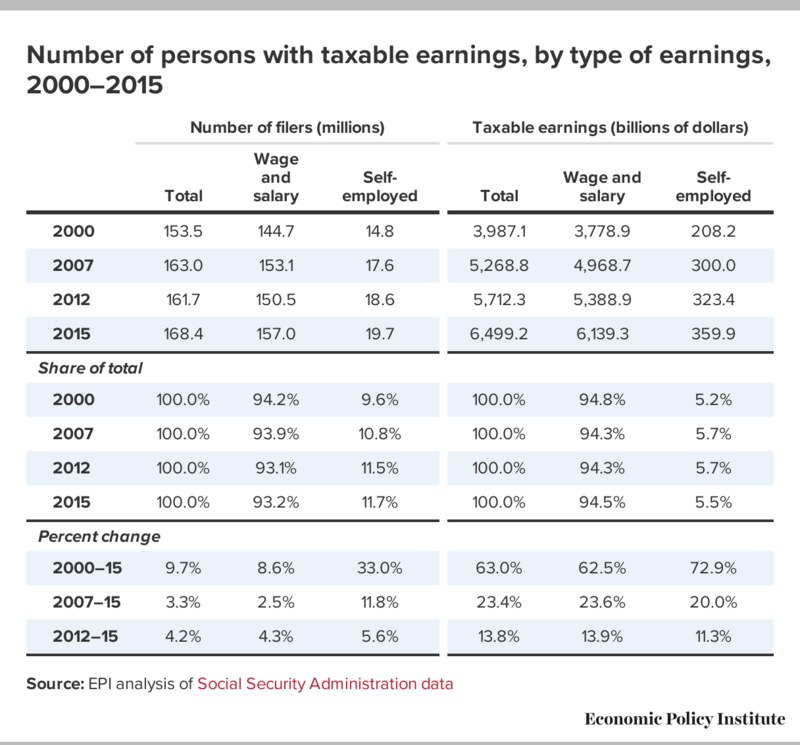 Measured by its share of total earnings (see Table 1 and Figure B), self-employment earnings grew from 5.2 to 5.7 percent of all earnings between 2000 and 2007 but then fell slightly to 5.5 percent of all earnings by 2015, a decline that occurred during the expansion of Uber and gig work following 2012. Another way to describe this trend is to note that W-2 earnings comprise nearly all of earnings, roughly 94-95 percent of the total, and it has remained that way throughout the 2000–15 period. That is, self-employment earnings remain a very small share of total earnings. This hardly accords with the notion that we are all becoming freelancers or that surging secondary self-employment activity has had a sizable economic impact. There has been much discussion of the expansion of self-employment in the context of the “future of work” or the “evolving nature of work.” The accumulation of evidence from administrative data (i.e. nonemployer establishments), tax return data, household surveys like the Current Population Survey and the Contingent Worker Survey tells us that there has been an expansion of self-employment activity—more people are involved—but that most of the growth is by people seeking supplementary income on top of what they obtain from their main source of income. There has not been an expansion of self-employment in peoples’ main job. I would contend that the most important metric for examining of the “future of work” or the “evolving nature of work” would be the quality and nature of how people earn their living on their main job: judged in this way, self-employment has not become more prevalent and altered how people earn their living. That is, the growth of self-employment does not reflect a ‘rapidly changing nature of work’ and does not signal that freelancing will come to be a dominant way that people earn their living. This analysis of SSA data confirms the patterns identified in other data on self-employment: the number of workers and the share of the total workforce with some income from self-employment is up. 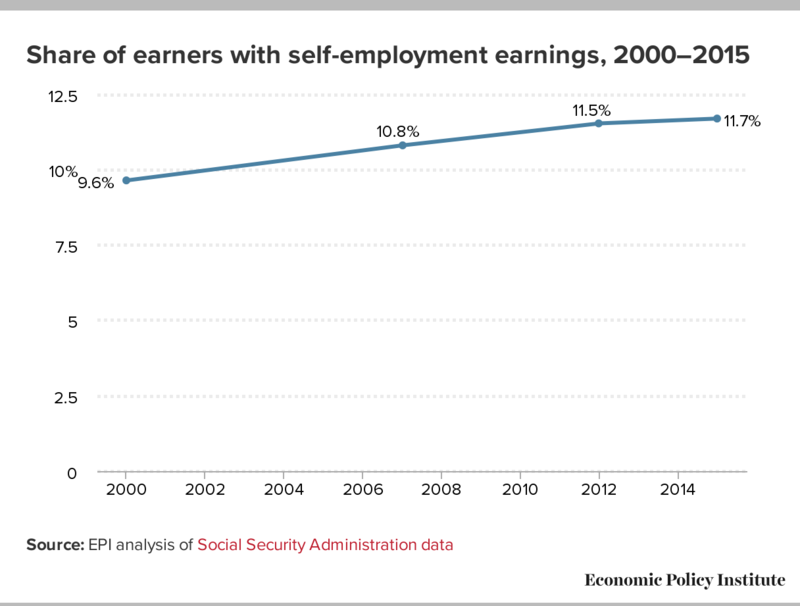 In 2015, 11.7 percent of all earners had some income from self-employment, up from 10.8 percent in 2007 and 9.6 percent in 2000. But, this growth has not been driven by the development of online platform work in the recovery, as evidenced by the slow expansion in self-employment income in the SSA data covering 2012 to 2015. The SSA data also confirm that self-employment’s economic impact has remained small. The share of all earnings derived from self-employment held steady at about five to six percent over the entire 2000–15 period. 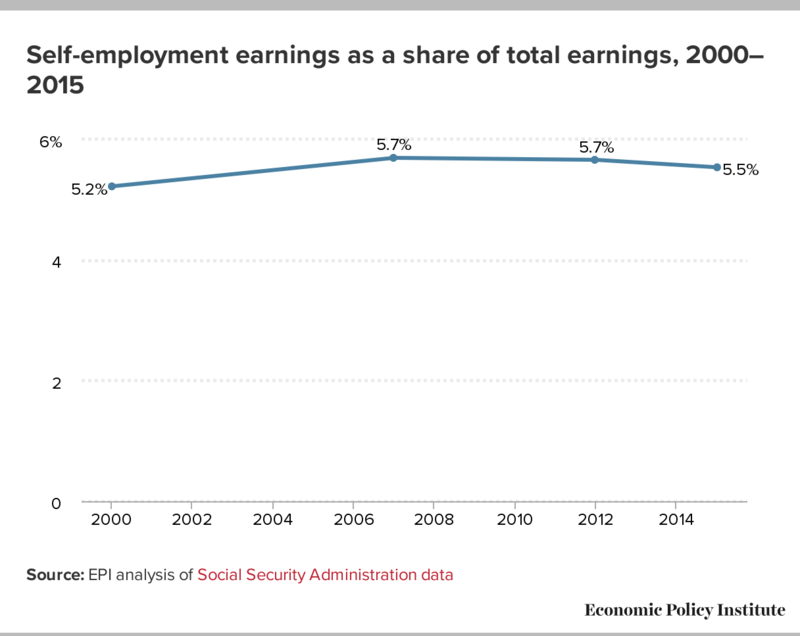 That is, W-2 employment has generated more than 94 percent of all earnings over the entire 2000–15 period, including in the most recent year of SSA data covering 2015—at 94.5 percent. The regular W-2 job is not disappearing or becoming less important. At the same time, we should be curious as to why self-employment activity to supplement regular W-2 employment is on the rise. That should probably reinvigorate inquiry into the failings of people’s main job to provide adequate income, benefits, and security. That job quality problems are widespread can be illustrated by data on workers in traditional jobs (i.e. the roughly 90 percent of workers not in “alternative work arrangements”) from the recently released Contingent Worker Survey that have gone unnoticed because all of the attention was on those with alternative work arrangements: workers in traditional arrangements have a low and deteriorating receipt of key health and pension benefits. In 2017, only 53 percent of workers (down from 56 percent in 2005) in traditional jobs received employer-provided health insurance. An even lesser share, just 46 percent (down from 48 percent in 2005) of workers in traditional jobs, were included in employer-provided pension or retirement plans in 2017.